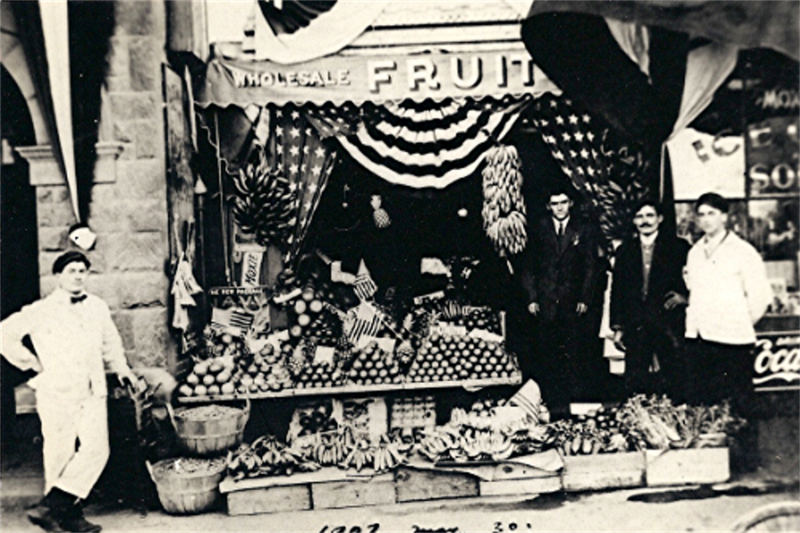 The photograph is of the original Center Street fruit store of Greek immigrant Thomas Panesis (who appears second from the right). Panesis entered the fruit selling business at Taunton in 1899 and later became familiar with Middleborough where he operated delivery carts following 1901. In 1906, Panesis relocated to Middleborough, occupying a small building which stood between the Middleborough Savings Bank Building and B. F. Tripp's ice cream parlor and which had been constr...ucted in 1895 by L. P. Thatcher for use by George F. Bryant as a coal office. 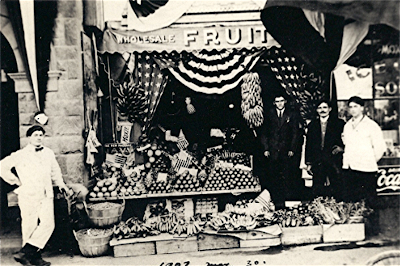 In addition to the great variety of fresh fruit sold by the Center Street firm (a portion of which is displayed here), tobacco and candy were also available and in 1909 a cigar case was added in the small space. Fresh roasted peanuts were also retailed (even following mid-June 1909 when the peanut roaster at the store exploded, injuring employee Peter Zamfes). Residents of the period would long afterwards recall the smell of freshly roasted peanuts wafting from the store. So successful was the business that in late 1909 Panesis was compelled to rent additional space elsewhere in Middleborough for storage. Ultimately, in 1913, Panesis relocated his business to a larger building on the opposite side of Tripp's where it remained for another three-quarters of a century, becoming a Middleborough institution. Although this photograph is marked "1907 May 30" at the bottom, a different photograph which was clearly taken on the same day and which appears in Mertie E. Romaine's History of the Town of Middleboro, Massachusetts, is labelled July 4, 1906, the more likely date. The Middleborough Savings Bank Building is recognizable on the left of the picture while the window on the right advertising ice cream, Moxie and Coca-Cola belongs to Tripp's.